ur Insight Vacations' (Insight) chariot, en route from Orvieto, comes to a stop in front of Perugia's Sangallo Palace Hotel, a clean, comfortable and friendly four-star property that'll be our base of operation for the next two days as we continue to motor around the Umbria in central Italy. The only problem I have, the first so far, is that our group of international media arrives under the cover of darkness. 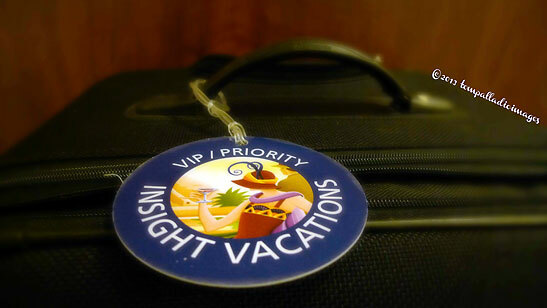 Granted, we're privileged guests of Insight, along for the ride to sample an abbreviated version of its 17-day Country Roads of Italy itinerary, but, still, it feels strange to de-board like a squad of ninjas in stealth black vice normal tourists in broad daylight sporting bright colors. We're all here on assignment for our respective publications to write and shoot (read, photograph), and, hopefully, promote the people, places and things we encounter along the way. But we can't write about the pp&t that we can't see. Or, can we? 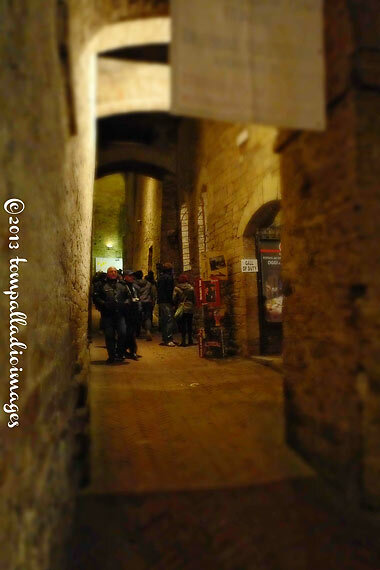 Perugia gets very dark in late fall when the sun goes down. 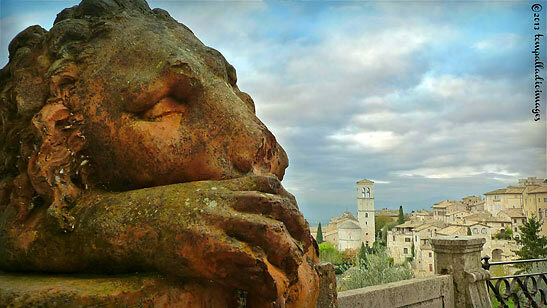 It's also the capital city of the Umbria region of central Italy. Perugia is referred to as the University City, with a host of schools of higher learning, including the University-of-P, founded way back in 1308. And, most importantly, Perugia is home to Perugina, an Italian confectionery known the world over for its baci, large chocolate kisses filled with hazelnut and wrapped in a multilingual love note, kinda like a Chinese fortune cookie only much, much better. One of these round mounds of goodness was waiting for me when I checked into the hotel, lying on the bed, tempting me to, dare I say, unwrap it. 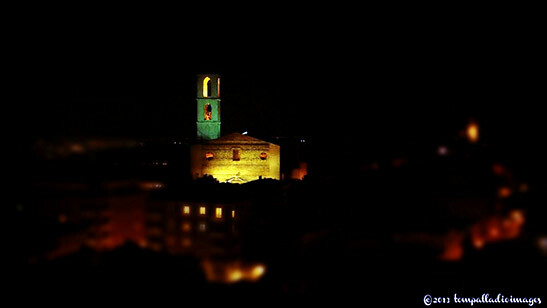 I'm sure there are lots more to Perugia than meets the eye, but, like I said, it's pitch-black outside. 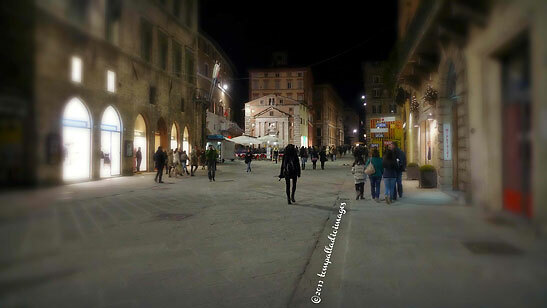 All of the street lights appear to be in good working order as we fall in step behind the lead silhouette, Marco, Insight's Umbri expert, and find our way into the underbelly of the city's centro storico (historical center). 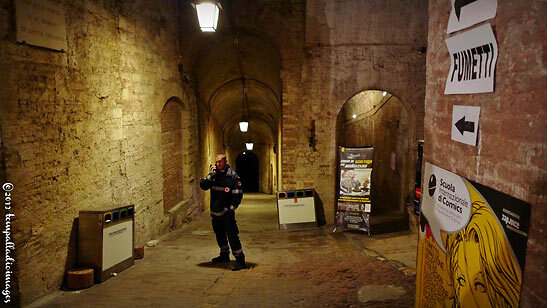 You see, Perugia has a mysterious side to its personality, the remains of the Rocca Paolina Fortress  a 13th century medieval quarter that belonged to the all-powerful Baglioni family  that supports a younger, 19th century urban area above when Perugia, part of the Papal States, was gobbled up in Garibaldi's land grab that transformed all of La Penisula into the Kingdom of Italy. What remains today of the Rocca are the old living areas, some streets, courtyards and squares, workshops and an intact tower. It may have been buried by the newer look above ground, but it's still very much alive today as the cavernous brick underground, with its network of escalators, is an epicenter of market activity with lots of vendors selling their wares as throngs of people pass by. Tonight, the city's inners are bustling with local Perugini as our band of merry media, plugged into Marco's running commentary of historical footnotes like he's guest hosting Jeopardy, makes its way to the first of two escalators that'll take us topside for tonight's final quiz show question. 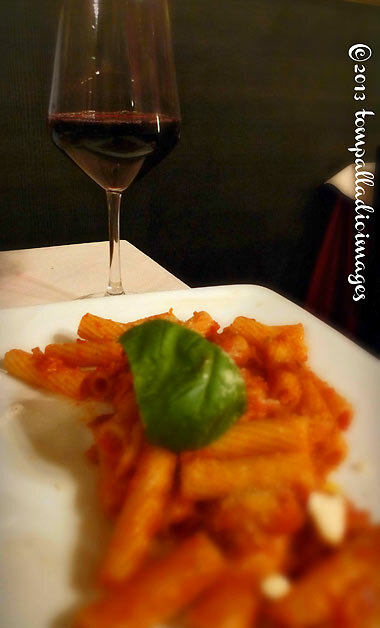 Marco-slash-Alex Trebek: Red sports cars have nothing to do with the toppings found at this popular eatery in Perugia. 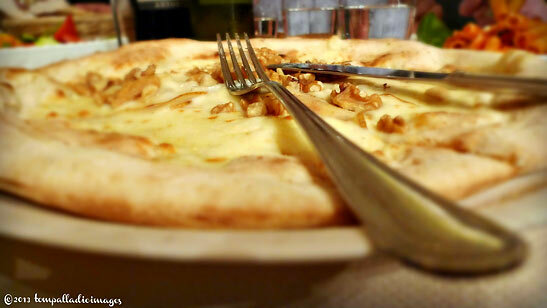 We answer, in the form of a question: What is Ristorante-Pizzeria Ferrari at 1 Via Scura? As announced on the ride over from Orvieto, John Boulding, the President and CEO of Insight, is picking up the tab for tonight's pizza dinner. John, a very tall drink of water from England even when he's sitting down, runs a pretty tight ship and is very passionate about the Insight brand. His team members, at least those along on this journey, just love him. Picking up the tab, I'm sure our group of media will love John even more. Outside again, we take Corso Vannucci, the wide pedestrians-only street of the centro storico, at a fast pace, hang a left onto Via Scura and make our way down the steps into Ferrari's. 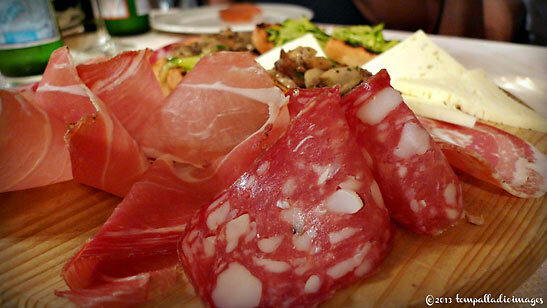 Drinks arrive, along with large wooden boards filled with antipasti (appetizers), and food orders are taken. Tapping a glass with a fork to get everyone's attention, JB stands, raises his goblet and officially welcomes all of us aboard Insight's Country Roads of Italy journey around Umbria and Tuscany. We listen attentively to his every word  business class legroom, signature moments, luxury accommodations, premium-escorted journeys, etc., etc.  as we have to play extra nice to ensure that at the end of the meal he still wants to lay plastic down to cover the damages. The mission statement delivered, John returns to his seat, grabs his coltello and forchetta and the feeding frenzy begins. Hey, who broke ranks and ordered pasta instead of pizza?, someone at a nearby table barks. I did, proclaims Nigel H, Insight's London-based Manager of Product Development, a.k.a. "the Fixer," the chap who works his logistics wizardry behind the scenes to ensure that each and every Insight journey lives up to its The Art of Touring in Style billing. You know that sound a proverbial foot makes when it's pried loose from someone's mouth? Priceless. 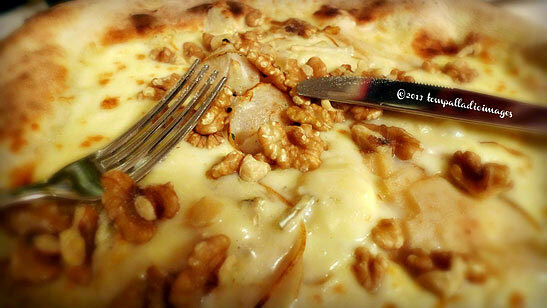 I order a pizza in bianco (sans tomato sauce) with a late-autumn topping of pear and walnuts that blends nicely with the mozzarella and brie cheeses underneath. The pizza is darn tasty and I inhale it pretty quickly. Thumbs way up for Ferrari's. The dinner now finished and no hat passed around, I guess Signor Boulding uttered those four magic words: Il conto, per favore. 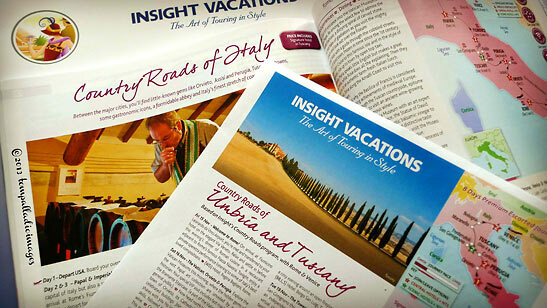 To learn more about touring in style on one of Insight Vacations' 12 Italian premium and luxury-escorted itineraries or one of its 100 other journeys around Europe, just click HERE, or call toll free (888) 680-1241, or contact your travel agent. On second thought, arriving in the dark wasn't such a bad idea after all. It gives a budding travel writer like me a whole new perspective. Now, if I could just master night photography. 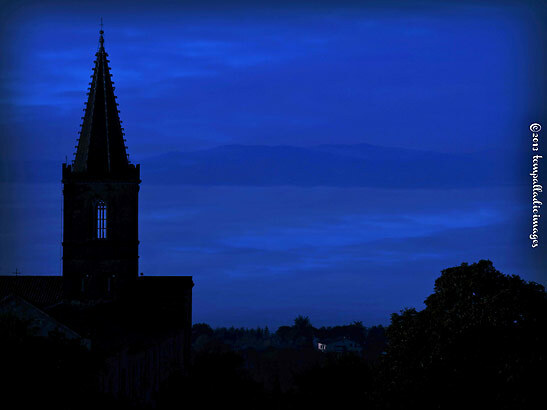 I'll think about it tomorrow when we head over to Assisi, IN THE DAYLIGHT.